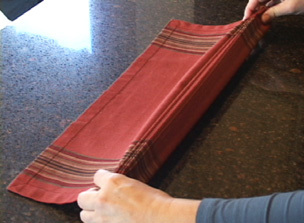 RecipeTips.com's video demonstration, 'How to Fold Napkins,' is an easy-to-follow guide to learn to fold napkins for you dining table. Hi! This is Laurie from RecipeTips.com. Today, we are going to be doing several different napkin folds that will be perfect for your holiday table or any occasion. The first napkin fold that we are going to be doing is the tulip napkin fold. Start with a lightly starched and pressed napkin with the back side facing up. Turn it at a diagonal so the corner is pointed away from you; then take the bottom corner and fold it up to meet the top corner. Take the corner on the left side and bring it up to touch the point at the top; then do the same on the right hand side. Take the left hand side and fold the edge to the center line, press it with your hand, and do the same thing on the right hand side. The next step is to pick up the napkin and fold the napkin away from you so that the folded edges are at the top, and lay it down on your table or flat surface and let the folds fall. 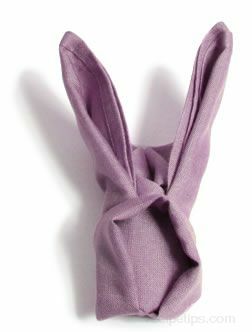 Take the center fold and flatten it out with your hand, and just adjust it a little bit and you will have a perfect tulip napkin fold. 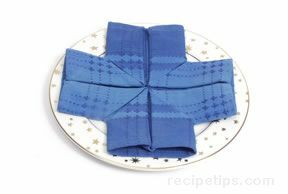 Now I am going to show you the accordion napkin fold. 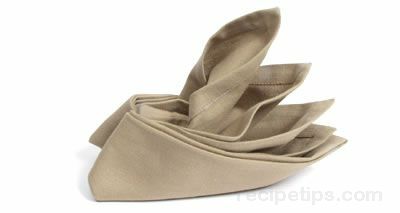 Start with a lightly starched and pressed napkin, and begin by folding one edge an inch to an inch and a half in, and then all you need to do is fanfold this, tucking it under and then over, following the one inch to one and a half inches. Once you have finished with your fanfold, take one edge and fold the napkin completely into the center so that the open edges are on one end; then take a napkin ring and slide it over the folded edge. Lay it out and fan the top; and this is the accordion fanfold. Next is the pocket napkin fold. Begin with a lightly pressed and starched napkin with the back side facing you; then you want to fold it into quarters so you create a smaller square, and place it so that the open points are away from you. Take the top layer of the napkin, and start by folding it about an inch to an inch and a half, and just roll it all the way down until you reach the center of the napkin. Flip the napkin over, and then take the left corner and fold it into the center of your napkin, and do the same thing on the right corner; and holding it, flip it back over, press it flat, and you have created a perfect pocket to insert your utensils. This is the finished pocket napkin fold. The last fold I will be showing you is the classic napkin fold. Just like the other napkins, start with a lightly pressed and starched napkin. Take the napkin and turn it so that the point is away from you; then grab the bottom corner and bring it up to the top point, and press it with your hands. Turn the napkin so the point is facing you, and take both layers and bring it up to the top. Take the left hand corner and bring it down towards you, straight down, and press it with your hand; then take the right hand side and do the same thing, and you have created a small square. The next step is to gently pick up the napkin and turn it over, and then take the left hand bottom point and bring it ups towards the top point, and do the same thing on the right hand side. Take the left hand corner and fold it completely over in half onto the right hand side, pick it up, then place it on your plate for the classic napkin fold. 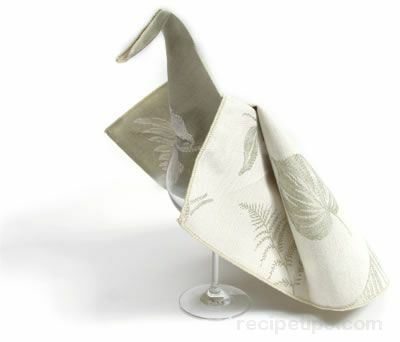 For more varieties of napkin folds, visit RecipeTips.com.